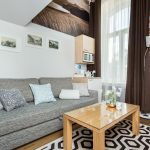 Treat yourself to luxury home comfort at incredible value in the heart of the Tallinn. 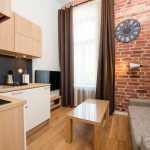 Stay in apartment hotel in the center of the city near the Old Town. 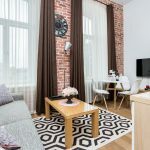 Our stylish, deluxe apartments feature high end Estonian design and enjoy peaceful views of either the Old Town or fashionable Rotermann Quarter. 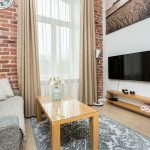 The best of Tallinn will be right on your doorstep from medieval streets to trendy neighbourhoods, as well as the harbor and business district. 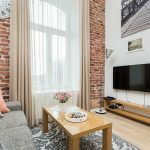 All our flats are modern and newly renovated, yet located inside a stunning 19th century cultural monument with authentic Romanesque details. 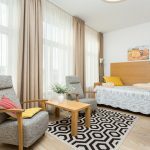 Our luxury apartments include the best of Estonian design and is nestled between the highly fashionable Rotermann Quarter, the medieval Old Town and the Baltic Sea. Our apartments are ideal for visitors who enjoy high end living, but at an affordable price. You’ll have all the city’s highlights on your doorstep outside, but also your own private sanctuary inside. 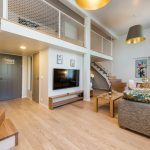 No expense has been spared inside with wooden floors and cabinets, carefully curated art and high end furnishings from renowned Estonian designers, such as Tarmo Luisk. You’ll have your own modern kitchen with all the pots, pans and utensils needed to cook a delicious meal. There’s a supermarket just a few minutes away for ingredients or, if you’re feeling more adventurous, pick up some freshly caught fish in the nearby harbor market. There is a large flat screen TV and fast, reliable internet, as well as a space where you can work if needed. The view outside faces either the medieval city walls and St. Olaf’s Church, or the exciting Rotermann quarter and the Baltic Sea. Our concierge is at your service 24/7. Top restaurants are just next door, including Ö, Kaks Kokka and Sfäär, while the fashionable Rotermann quarter is round the corner. There are great cafes, shops, bars, cinemas and nightclubs nearby, including the huge Viru shopping center and Forum Cinemas. There are also many prestigious theatres in the area, as well as the Estonian National Opera House. Your Taxi will easily find our building and it’s only a short 7€ ride from the airport. Arrive by cruise ship or ferry and it’s even easier as we’re just a pleasant few minutes’ stroll. The entrance to the Old Town is just across the road where you will see St. Olaf’s Church towering above the city’s ancient walls. Enjoy getting lost in the medieval streets, but don’t miss the lookout spots on nearby Toompea. The business district is close by, but for something very different you can walk to the hip Kalamaja area. 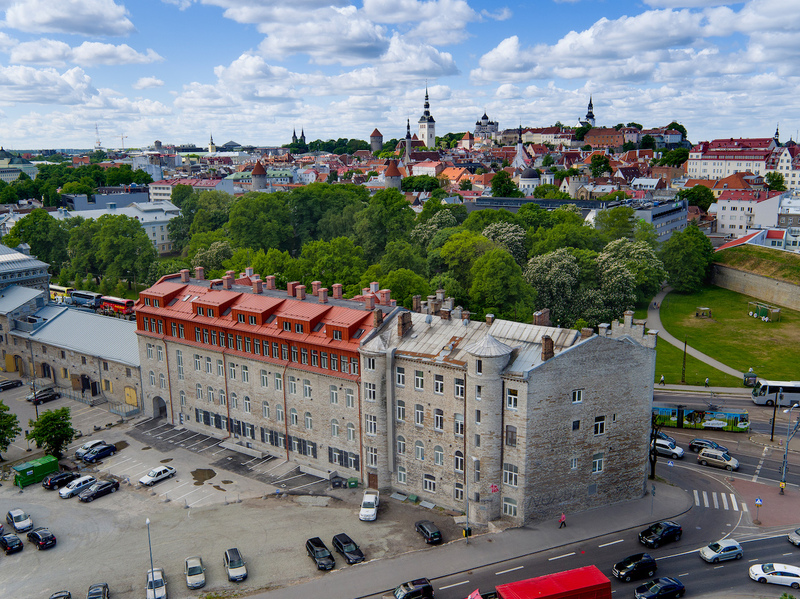 There you can party in converted factories and see traditional wooden Tallinn houses. The seafront is also nearby, including the imposing soviet Linnahall structure built for the 1980 Olympics. Climb up to enjoy the sea views, which is particularly incredible during the endless white nights of summer.